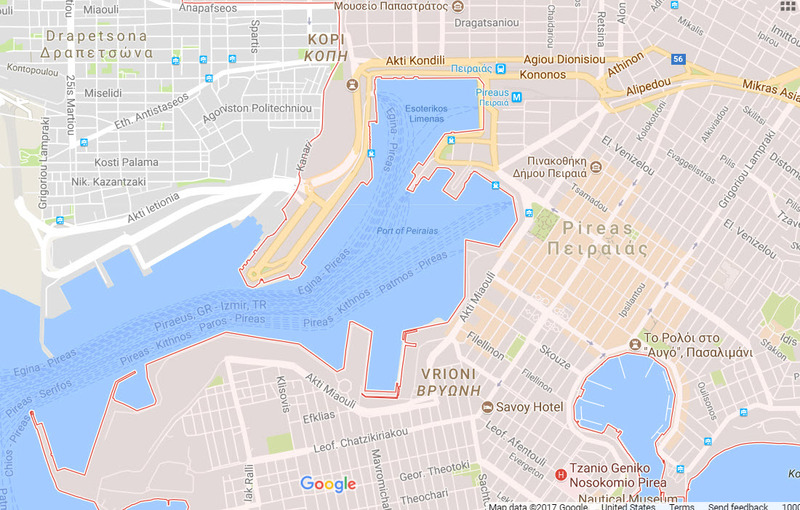 The port of Piraeus is a lively and bustling community of winding streets, hotels, apartments, and shops. As the maritime gateway to Athens, its three harbors stretch for miles around the shoreline, providing numerous docks for cruise ships, fishing boats, and private yachts. Its history begins in the 5th century B.C. when it was designated as the trade center of Athens, seven miles north. Today, it is the largest passenger port in Europe and the second largest in the world. The waterfront is a most picturesque spot to stroll and explore. Countless cafes and restaurants beckoned me to stop and enjoy the view. At 7:30, my friend, Giannis, and I met at an outdoor bar, overlooking the water. We talked for hours about history, genealogy, and village life. At dinner time, 9:45 (! ),we moved to a sidewalk table and enjoyed traditional souvlaki while harbor life swirled around us. 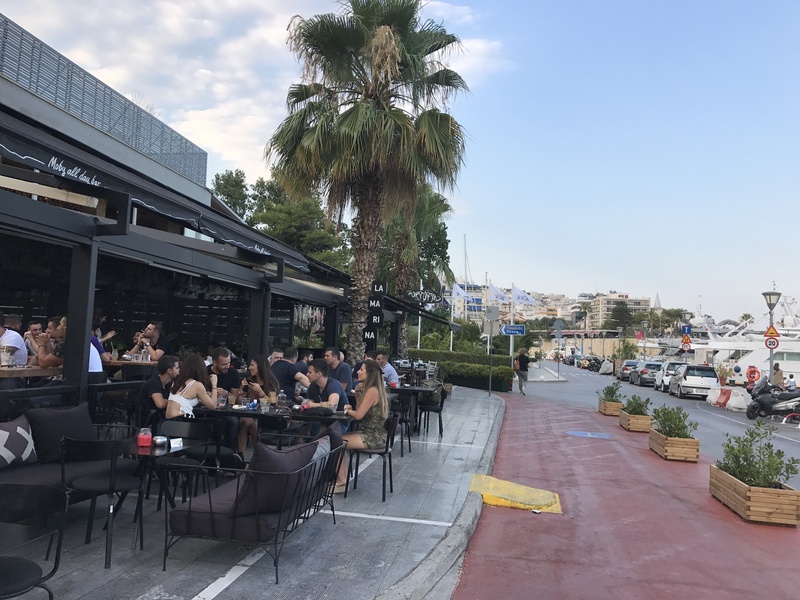 One of thousands of restaurants along the Piraeus waterfront. But the sites of Piraeus go beyond the nautical and encompass the archaeological. 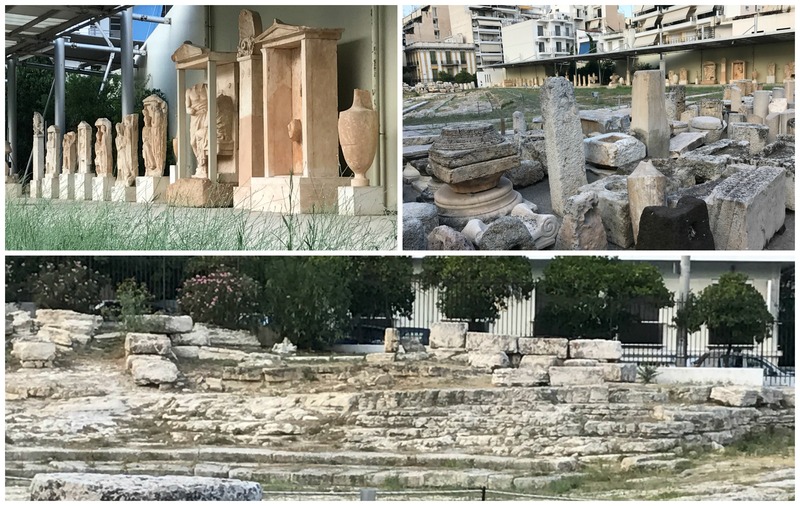 While visiting with my friend, Giota, I was stunned to see ruins in open areas–precious relics which I assumed would be safely ensconced in a museum. Wrong! There are so many ancient treasures in Greece that there are not enough museums to hold them. The artifacts in these photos were “protected” by an iron fence and situated in a residential area. It is hard for me to wrap my head around the history which permeates everyday life in Greece. To natives, history is not facts read in a book; it stares them in the face wherever they turn. It is a pillar that is passed on the way to work, or a statue that is seen outside an apartment window. It is the anchor of Greek identity and the substance which forms its collective unconscious, and mine. 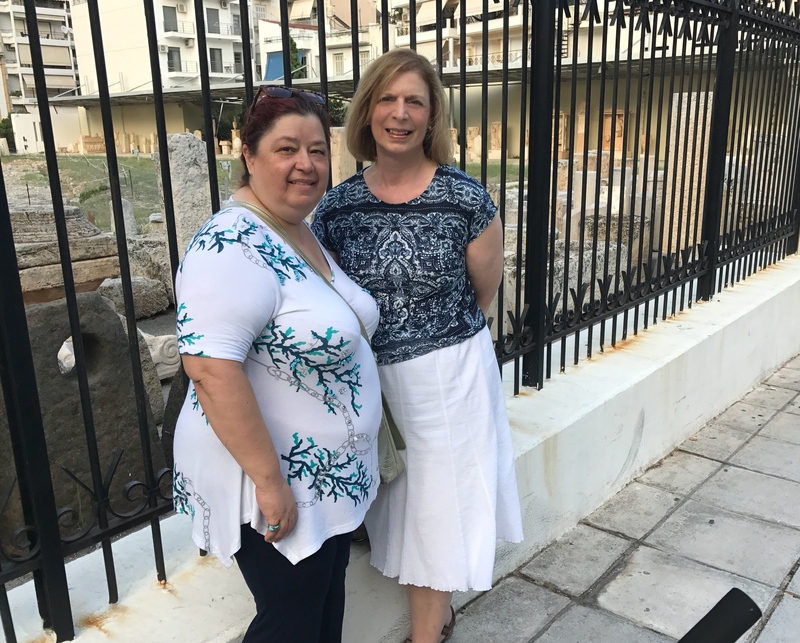 This entry was posted in Genealogy, Greece 2017, Trips and tagged Piraeus by Spartan Roots. Bookmark the permalink.